Nice furnished apartment, city centre - the Vatican district. 1 large terrace (25 mq). At your disposal you will find FREE INTERNET WIFI, air conditioning, linen and towels, television, mini hi-fi, clock radio, hairdryer, iron and ironing board, microwave, kettle, toaster, baby bed (cot), additional bed for young until 12 years old. On your arrival you will find leaflets and maps of the city. We are glad to tell our guests that the apartment is now furnished with new windows with antinoise fixtures and glass. So our pleasant apartment is now quiet too !!! Rome city tax of 3,5 euro for night per person over 10 y.o. Ideally located, in the Vatican district, in the city centre. We found the apartment to be as advertised. 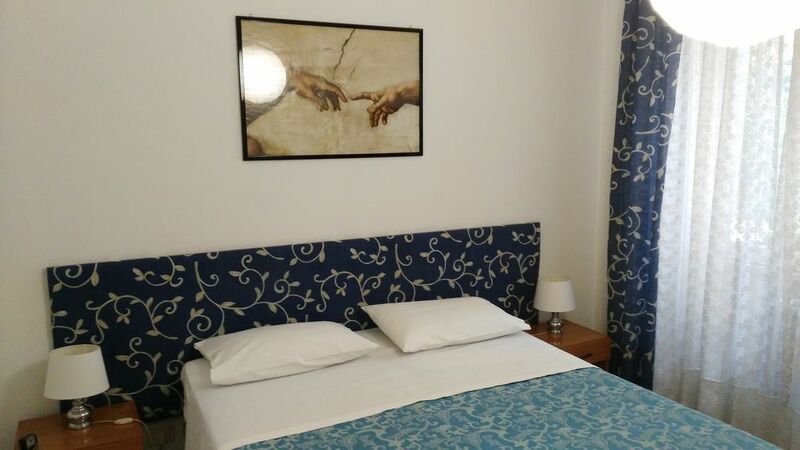 Clean, comfortable and affordable in a safe neighborhood of Rome. Convenient for walking to the Vatican and for using city buses and subways. The kitchen and bath are small in size but contain everything needed or expected. Angelo was very helpful and provided lots of literature for touring Rome. We have fond memories of our stay at his apartment in Rome. "This was an ideal location with easy walking access to the Vatican (10 minutes) and other sites, too. The area had all the shops needed to shop for groceries, restaurants, and cafes to feel at ease and enjoy the city. The apartment was spotless, safe and quiet. Angelo, the landlord was couteous, accommodating, and provided us with all the info about sightseeing and arranged transportation for us to the airport at a fair rate. We are confident in recommending this apartment." "What a great apartment and a perfect location. Angelo was there waiting for us when we arrived and provided us with lots of information about the area. We liked that the apartment was close enough to everything, but not in the center. It was nice to have the supermarket so close and the terrace was great to relax on in the evening after a long day of sightseeing." "The flat was found clean and was found as described. The surroundings are quite noisy but what would you expect in Rome but the flat is very secure and when windows are close not a lot of noise is heard. The garden is small and very quite. We have two kids and it was very easily accessed." "We stayed 7 days in Rome. Everything was as allready hope, a large appartment with all facilities you need for staying in very good conditions and a beautiful terrace (...to rest after a day of walking). Mr. Angelo tell us everything we need to know about surrounding, nearby tourist attractions,shops, restaurants and supermarkets. Overall a very good choice! I certainly will stay here next time when I will visit Rome!" The apartment is in the district around the Vatican city. The Vatican Museums (Sistin chappel) are 5 minutes on feet far. you can reach the Vatican Museum in a 5 minutes walking and in just 10 minutes you can walk to St. Peter’s Church. Once there, you can visit the main monuments of Rome, one after the other: Castel S. Angelo, Navona Square, Venezia Square. The bus stop is 100 metres far. What is more, by a night bus (rides every 15/30 minutes) you can quite easily visit the city even after midnight. Only within 100 metres, you can find bars, restaurants, pizzerias, a fast food, a supermarket, a discount market, a drugstore (open 24 hours a day), a bank, a laundry, internet point, a newsagent’s and a chemist’s.